Task: Design and build of a healthy meal preparation device. EGPR 2014 was hosted by the University of Ljubljana, Slovenia. 42 undergraduate students from five international universities were involved. BSH Company is a leading European manufacturer of household appliances setting the trends with innovation in the otherwise conservative market of small household appliances and are constantly searching for and opening new market segments. To intensify this process and to get insights into different target groups, the BSH Company leads a strategy of intensive cooperation with educational institutions. For that reason and based on good experience with EGPR 2010 project the company made an order for a new project within EGPR 2014. 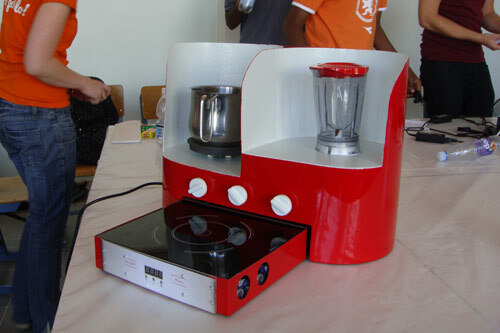 The objects and goals of the project were to develop the idea for a device which would radically ease the process of healthy meal preparation. The initial idea was to shift the traditional perception where food preparation gravitates around the stove to the new device, which will prepare and transform the ingredients into a fresh, healthy meal. Students investigated mechanical and thermal food processing technologies with special attention on new, innovative and unconventional food processing principals and solutions. Several teams investigated ways to give the user an interactive experience through the use of available technologies, from buying food, tables with nutrition facts, database of recipes or serving ideas. The final workshop was held in early July 2014 in Ljubljana, where the participating students came together to assemble and test their prototype devices.